Monte Cristo Tortilla Rolls Ups are a fried appetizer recipe, and a fun new way to eat everyone’s favorite sweet and savory sandwich, but in appetizer form! 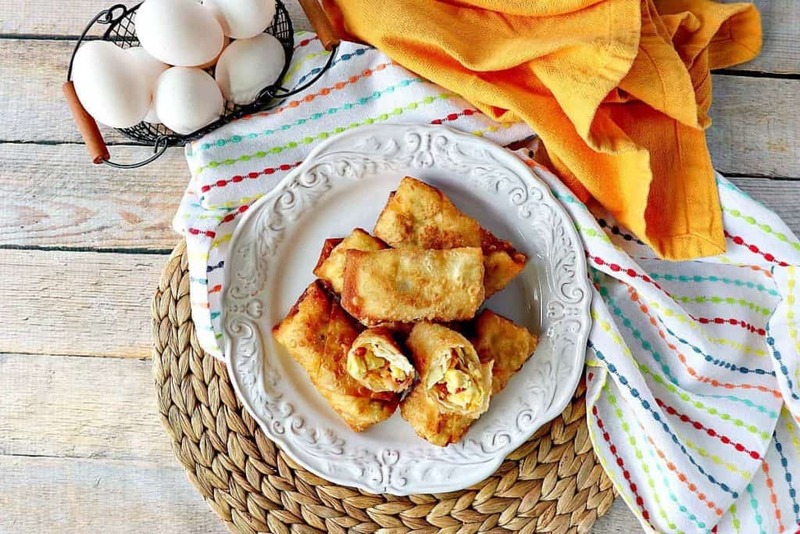 **Please Note – The printable recipe card with detailed instructions, complete ingredient measurements, and nutritional information for making this fried appetizer recipe for, Monte Cristo Tortilla Roll Ups is available near the end of this post. Can Monte Cristo Tortilla Roll Ups be made in advance? YES! You’ll notice in the video that after the roll ups have been fried, they can be reheated on a rack in the oven. Using a rack will keep the roll-ups crispy and crunchy on all sides. How many appetizers does this recipe make? 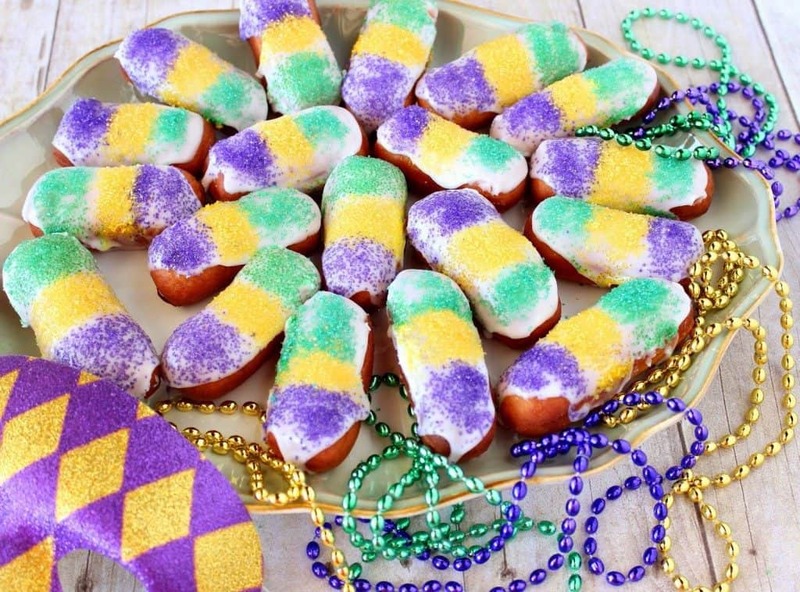 As written, this recipe makes approximately 24 Monte Cristo Roll-Ups. However, this recipe can easily be doubled or even tripled if needed. What is the best oil for frying, and what is the proper temperature for the oil? 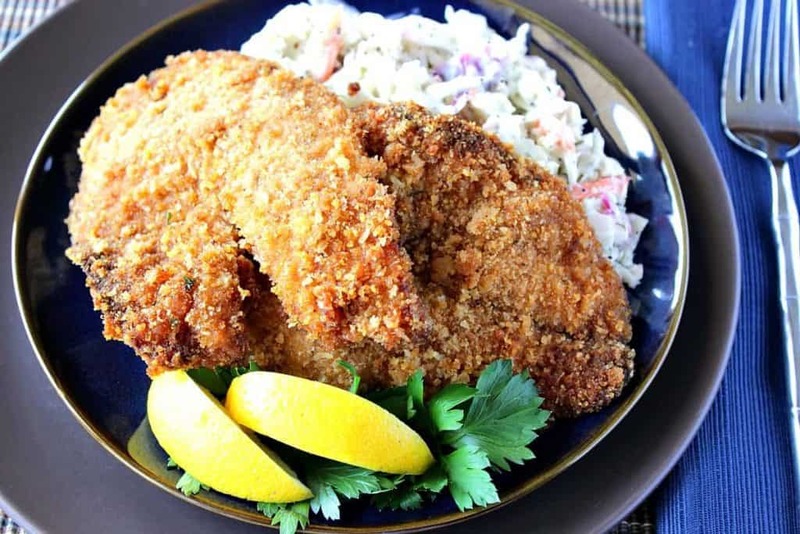 A good rule of thumb for frying is the lighter the color oil, the higher the smoke point, and the better for frying. My preferred oil is peanut oil, but grapeseed comes in a close second. The best temperature for frying is between 350-375 degrees. What if I don’t have a thermometer to test the oil temperature? What then? Here’s a handy trick; when heating oil for frying if you don’t have access to a thermometer, dip the handle tip of a wooden spoon into the hot oil. If lots of tiny bubbles immediately form around the handle of the spoon (much like champagne bubbles) your oil is hot and ready to fry. If the bubbles take long to form (longer than 1-2 seconds), the oil is not hot enough and needs more time. Can I reuse the oil after frying? I do. I use a funnel to funnel the oil back into the original container and then I reuse it for 2 or three more fryings. However, if I’ve fried fish or seafood with a particular oil I would only reuse that oil for another fish or seafood dish, as I wouldn’t want my Monte Cristo Roll Ups (or donuts, for example) to taste like fish or seafood. After two or three fryings, I always discard the oil and start with fresh oil for the next fried recipe. What in the world is sandwich paste? Gotcha! It’s a mixture of flour and water. It helps to seal the tortilla edges so the fillings stay inside. 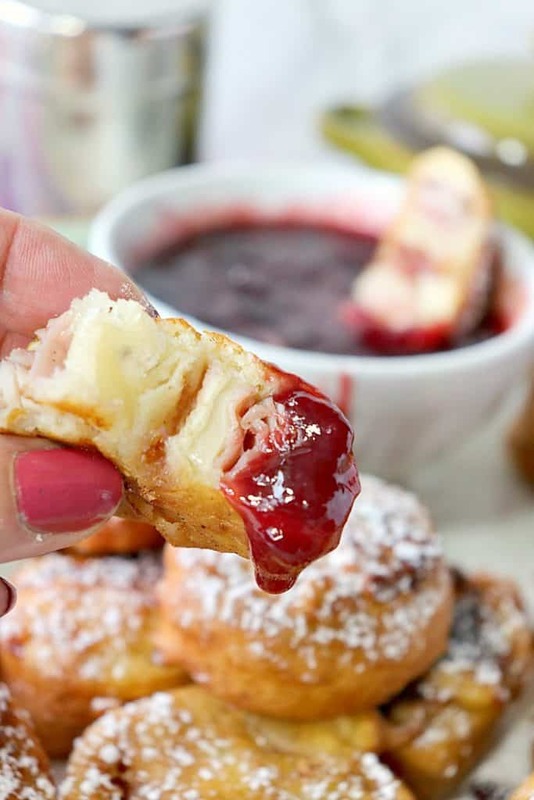 **The following affiliate links are some suggested products I’ve chosen that will aid you in the making and serving of this recipe for Monte Cristo Tortilla Roll Ups if needed. By clicking on the item photo, you’ll be taken directly to Amazon.com if you’re interested in purchasing any of these products. You are in no way required to do so, and you will not be charged in any way unless you decide to purchase one of these products through Amazon.com. As an Amazon Associate, I earn from qualifying purchases. Below is the printable recipe card for today’s Monte Cristo Tortilla Roll Ups. If you’ve enjoyed this recipe and look forward to making it (or have already made it), I’d appreciate if you’d take a moment to give it some feedback by way of stars near the comment section at the end of this post. Thank you so much! Monte Cristo Tortilla Rolls Ups are a fun new way to eat everyone's favorite fried, sweet and savory sandwich, only in appetizer form! Mix together the sandwich glue and set aside. Mix together the dipping sauce ingredients and refrigerate. In a medium bowl, whisk together the flour, salt, sugar, baking powder, and corn starch. In a large bowl, whisk the egg and milk. Gradually whisk the flour mixture into the egg and milk mixture until smooth. Set aside. The batter with thicken slightly. Spread approximately 1 tablespoon of the jam evenly onto each of the tortillas, making sure to leave a border around each tortilla, and at the top for the sandwich glue. Evenly divide and layer the turkey, ham, and cheese at the bottom of each tortilla. Spread a bit of the sandwich glue on the top of the tortillas and carefully roll each the Monte Cristo tortillas tightly, pressing at seams to glue shut. Place the tortilla logs on a baking sheet and freeze for 10-15 minutes. Meanwhile, carefully heat the oil to a temperature of 350 - 375 degrees. Remove the tortilla logs from the freezer. Trim the edges and discard. Use a serrated knife to slice each tortilla log into pinwheels (approximately 8 slices per log). 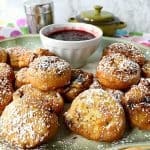 Dip each Monte Cristo into the batter (allowing the excess to drip off), and carefully submerge them into the hot oil. Carefully fry each roll up until golden on both sides (approximately 45 seconds, per side). Remove the fried roll-ups to drain on paper towels and season with salt if desired. Continue the process with the remaining roll ups. Line a baking sheet with a wire rack and add the Monte Cristo Tortilla Roll Ups. Bake or keep warm in a low oven (or a 350-degree oven if reheating) until the remainder of the appetizers are complete. 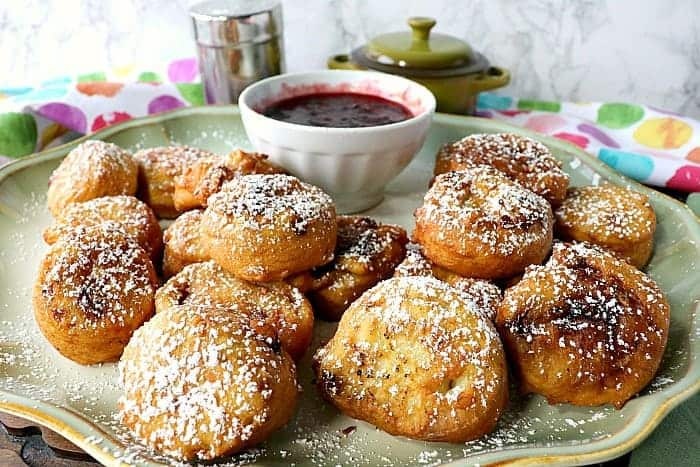 Sprinkle the Monte Cristo Tortilla Roll Ups with confectioners sugar before serving. 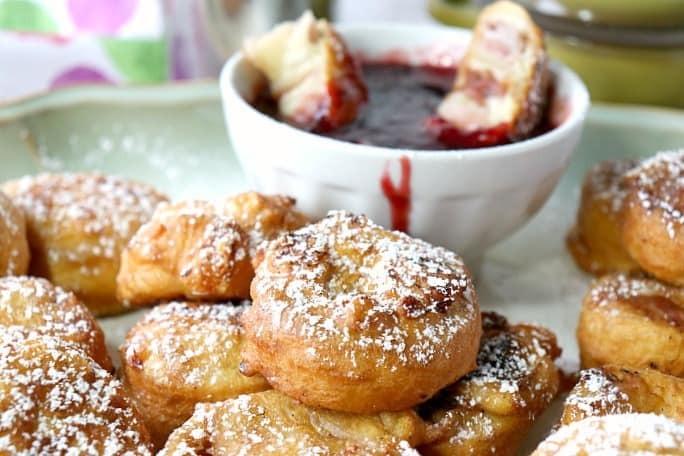 Serve hot with the raspberry Dijon dipping sauce. 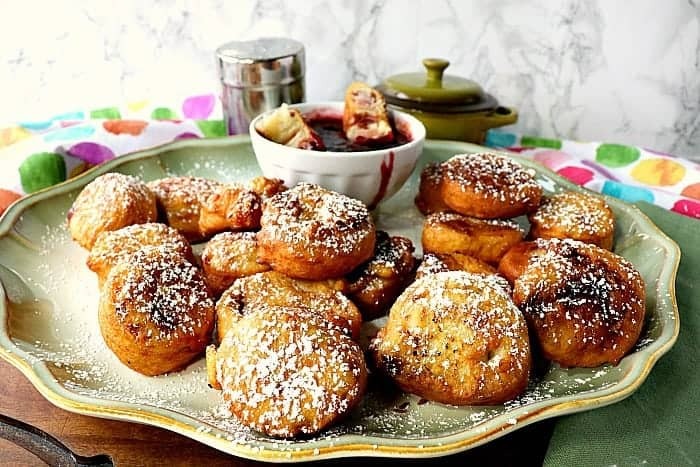 I sincerely hope you’ve enjoyed today’s fried appetizer recipe for Monte Cristo Tortilla Roll Ups as much as I’ve enjoyed bringing it to you! These are perfect for a party! And it’s such a creative recipe, it’s great for making with my family, too! Ummm… can I eat these FOREVER?! Holy cow such an amazing idea for a recipe! Love the idea! 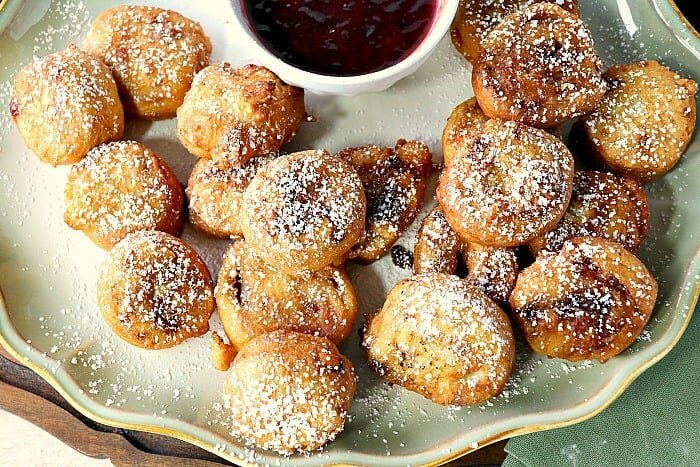 These will be perfect for a party!